Enter the vivid 3D world of Crash Bandicoot, a marsupial on a mission! His brain's been scrambled, his girlfriend is held captive, and his arch nemesis has a big N on his forehead! And you thought you had it tough! Our spiky-haired hero Crash needs no weapons to survive the harsh jungle. Instead, he jumps, jogs, and spins his way through numerous lush and downright fun environments. This top-selling game takes you away on a tropical island adventure that is filled with precarious enemies and challenging levels. You want a great old school game that's fun yet hard, this is the one. Great shape and shipped fast. Even with the N Sane trilogy out, it's nice to revisit where it all began. Lots of fun. Loved it! It was a great game over all, looked untouched surprisingly new! Game was delivered in a timely manner, was in excellent condition (near new, hardly any scratches, only freezes in one spot), and tracking my package was easy and quick. A-ok retro product, great service. Never got a chance to play this when it first came out. I love it and recommend it. 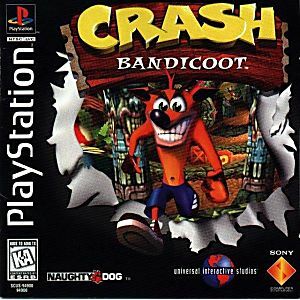 Crash Bandicoot it's a classic game ! It's a fantastic game , funny and cool for play !